During the whole Brexit process so far I have been astonished and horrified at how our democratic procedures have been corrupted and debased. The 2016 referendum was seriously compromised. Now some people are trying to prevent a referendum on the deal in 2019. Here are the reasons why in my opinion the People’s Vote in 2019 is urgently needed and why it is corrupt and dishonest to oppose it. Opinion polls indicate that in 2019, the majority of people are against Brexit. Many who voted for Brexit bitterly regret their choice. There are others – a much smaller number – who voted Remain and would now vote Leave. Huge numbers of young people who weren’t old enough to vote in 2016 are being denied a voice. Even if there was only a small chance that the people didn’t support Brexit, there should be a vote on the deal. It’s clear, the People’s Vote needs to happen. The majority should not be gagged into silence by the minority. 2) People oppose a referendum on the deal because they are afraid they will lose. 3) The People’s Vote will not cause division but could bring calm. One of the reasons given for opposing the People’s Vote is that it will ‘cause further division’. This is utter nonsense. Politics is about division and one side winning arguments over the other and attracting majority support. In 2016, the Brexit offered by Leave supporters wasn’t clear. It consisted of any number of different and contradictory possibilities. It’s one of the reasons why the majority was extremely slim. Now we know the facts better, people can express their preference in a new vote on the deal, based on the facts. If there is an increased majority either way, division can be overcome. It is a fact that the Leave side broke the law, and there is a strong possibility that the result was achieved through illegal tactics. It would be possible to declare the result null and void – in other juristictions it would be – but an alternative solution is simply to have a new vote, which has the advantage that people are making a decision based on facts and new knowledge gained over three years. The 2016 vote was advisory but the government immediately treated it as mandatory. In my opinion, the 2016 referendum gave the government a mandate to negotiate with the EU to explore what options are available, but not to impose their Brexit on a reluctant population. The whole Brexit crisis started with a referendum and the result of the negotiations – Mrs May’s unpopular deal or Remain – should be put to the people in a second and concluding referendum. 6) Millions were deliberately excluded from the 2016 vote. The legitimacy of the 2016 referendum is further undermined by the fact that the people most seriously affected by the negative consequences of Brexit were deliberately excluded. That’s to say, young people aged 16-18, nationals of other EU countries who have made their homes in the UK, not to mention expats who have lived more than 15 years outside the UK. The 2016 vote could be declared null and void – there are many reasons it should be – but another solution is to have the People’s Vote in 2019 and make sure those whose voices were kept silent in 2016 are given the opportunity to contribute in 2019. 7) The 2016 vote didn’t set a ‘minimum percentage’ requirement*. In the Scottish devolution referendum of 1979, 51.62% were in favour of devolution and 48.38% were against. Despite this, devolution didn’t go ahead as there was an amendment to the Act requiring a minimum of 40% of the electorate to vote “Yes”. As it was only 32.9%, the Act was repealed and devolution didn’t go ahead. This precedent was set in a UK referendum, and yet the Brexit referendum didn’t have this requirement, another reason why the referendum was not a mandate for Brexit. In an advisory referendum, the result cannot be treated as binary. The quality of the majority needs to be taken into account. If there had been a big majority for Brexit, for instance two thirds one third, then there would be no doubt that public opinion was in favour of the move. But the majority was only 3.8%, which some described as a ‘clear’ result. I disagree. When there is such a marginal result, public opinion could easily move by just a few percentage points and the majority would be wiped out. In fact, that is what has happened. The People’s Vote is urgently needed as it cannot be proven that there is a majority for Brexit in 2019. If either of today’s Brexit options – ‘no deal’ or Mrs May’s agreement – had been offered to the public in 2016, they would have rejected them and chosen to Remain. If people could have looked three years into the future to see what would happen, the result would have been Remain. If anyone doubts this, then the only way to prove that this is wrong is to hold the People’s Vote. Brexit is already seen around the world as an example of flawed democracy, ironically in the the country often quoted as the home of democracy. To survive in the world, Brexit Britain must be able to build trust and respect. If other countries suspect that the Brexit decision was forced through against the wishes of the population, trade negotiations will be much more difficult. Trade depends on trust. 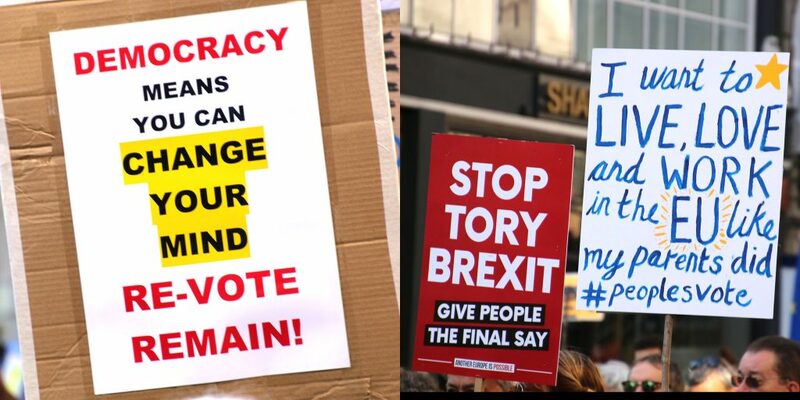 If whoever is in charge of Brexit Britain can point to a decisive win in the People’s Vote, then it has some measure of legitimacy. The People’s Vote is needed to rebuild trust and confidence. 11) Brexit is such a drastic and controversial step, it needs final approval. If what is being proposed was a relatively minor change in direction, then there might be less pressure to have the People’s Vote. But Brexit is of such a drastic nature, with so many dire and unpredictable consequences affecting millions, both within the UK and outside, it is simply undemocratic not to ask the electorate: ‘Is this what you really want?’. When you delete a file on a computer, you are always given a final dialog box asking you to confirm your decision. On a computer, many actions can be undone, but Brexit, like an execution, is an irreversible step. The British people must be asked to confirm this most drastic decision before it happens and if they reject it, then it must be abandoned and Britain must stay in the European Union. I haven’t even addressed the fact that the 2016 referendum was on a different question to what is being asked today. The question was, do you want to ‘leave’ the EU, but ‘leave’ was never defined. It was left up to anti-European propagandists to outline a variety of different scenarios, mostly involving more money for the NHS, no worsening of the conditions of access to the single market, no negative consequences and no damage to the British economy. The 2019 referendum will ask ‘Do you want to leave the EU on the terms negotiated by the government or stay in the European Union.’ The 2016 referendum asked people’s opinion on a vague theory with no specific plan. The 2019 referendum will ask people’s opinion based on a wide range of facts and on a specific proposal, which people can compare to the benefits of staying in. These facts should be provided in a detailed statement written on the ballot paper, as is normal practice in referenda carried out in other countries. 13) It should have been a two-vote process from the start. It still can be. It should of course have been a two-stage process from the start. Unfortunately the referendum arrangements were flawed, as it was assumed that the result would be Remain. A ‘Leave’ outcome wasn’t properly planned for. For that reason the right wing members of the Conservative Party were able to push for arrangements that would increase the chance of a ‘Leave’ result. It worked, and with no final check, there is the distinct possibility that the UK will be forced out of the EU against the wishes of the majority today. This is a grave act of tyranny, seen only in Nazi-dominated Germany or the Communist-dominated Eastern Bloc. We can still right this wrong. We can still make it a two-vote process by arranging the People’s Vote in 2019. It can easily be organised and carried out. 14) Brexit can still go ahead if a majority vote for it in the People’s Vote. If a majority vote for Brexit then it can go ahead. There would be nothing more anyone could do to stop it. It is a fair and legitimate political procedure, just like general elections. Every few years, the people choose between options and determine which political path the country should take, and that is what will happen in the 2019 referendum. If the result is for Brexit, then Brexit can go ahead. If the result is for Remain, then Britain stays in the European Union. *Reason number 7 was added later, with thanks to a contributor to Liverpool for Europe, increasing the number of points from 13 to 14. This is my timelapse video of the People’s March for the future held in London on 20 October 2018. For some time I had been planning to produce a time-lapse video of an anti-Brexit march. One of the purposes would be to help to ascertain how many people took part in the march. I figured that if it was possible to count the people as they passed, you could gain an accurate assessment of the number of participants. At around 1:20pm, I took up my place on St James’s Street and waited for the march to begin. When the police cars passed by, I pressed ‘record’ on the iPhone set to timelapse. It was held in a clamp on top of a small tripod. I left the phone running for some time and realised that it was running out of power and I would need to change to a different camera. I set up my Canon 70D DSLR camera and set it to video at normal speed. I was using a box on the street, a piece of street furniture with a flat surface on top, at chest height. I was able to lean on the box and check the camera. Later I took out my MacBook Air computer and downloaded some of the footage as I was recording. Many people smiled and a few stopped to show me their placard. A small number of people seemed to think that I was the filmmaker Michael Moore. A guy told me that with my baseball cap and reading glasses, I looked very similar to the celebrated American filmmaker. I decided to take the cap off because I didn’t want people to think I was somebody who I am not! I stood for approximately 2 1/2 hours recording the march continuously, except for small gaps when I needed to change the memory card and at one point, insert a new battery. When finally the police cars drove by, I assumed the march was over and I left. In fact after I had gone, I was told many more marchers came by, so unfortunately I didn’t quite get the whole of the march into my video. By the time I got to Westminster, the speeches had finished and there were large crowds. I later discovered that earlier in the afternoon, many of the marchers had not been able to get into the square at Westminster because there were simply too many people. The final estimate of participants was 700,000 or thereabouts. Naturally some Leavers disputed this number and maintained that the number was ‘only’ 200,000. As we have seen since then the maximum mumber of people that any Leave groups have managed to bring together is around 3000. I started to edit the video on the bus on the way home, using my MacBook Air computer. I wanted to upload it that night after I got back, but I needed to do more editing the next day. I posted the video on YouTube and immediately linked to it on Twitter. Soon I found that people were retweeting it and retweeting it and in the end it scored over 18,000 views. I was also contacted by an organisation who wanted to use it to try to estimate how many people took part in the march. 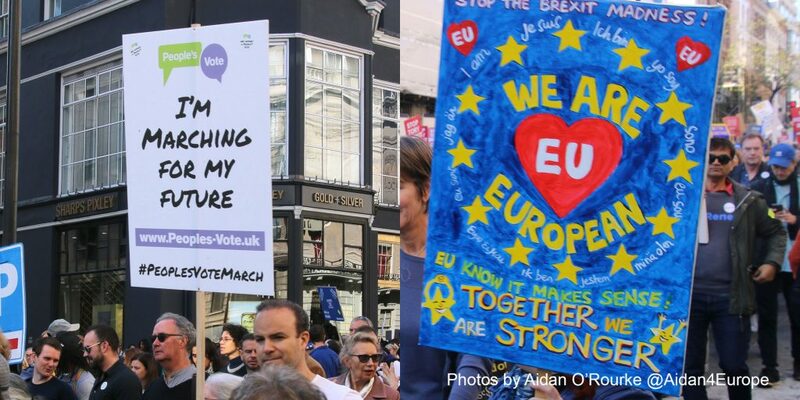 All in all I was a very happy to have been able to help in documenting such an important demonstration, a milestone on the road to the People’s Vote. When the final Remain march takes place, I intend to do another timelapse. In 2017 I translated this editorial by ARD correspondent Annette Dittert from German into English. It is not a clock that’s ticking from today but a time bomb, which easily has the power to destroy the United Kingdom. Without the faintest idea of how the exit can successfully be negotiated in two years, Theresa May, despite a clearly softer tone in her letter to Brussels, has stood by the idea of leaving the EU if there is no deal. Her Brexit minister said that such a ‘crash exit’ can easily be managed, but then he had to admit that he has no figures. But facts are just an irritation. Yesterday Conservative Brexiteers walked out of a parliamentary committee after the risks of a hard Brexit were presented to them. The report, they said, was too negative, and that was it, they were gone. In Brexit la la land, they just don’t want to know things in too much detail. The future in ‘splendid isolation’ will be glorious, the battle of Brexit must be won. Every warning voice is silenced. The Scots have been forbidden, for now, from pulling the rip cord. On this front things are going to become more and more explosive if it appears that Britain is heading towards a hard Brexit. Theresa May had nine months to prepare the hardliners for reality. Up till now there is nothing to indicate that she has been successful. In its own interests the EU must now ensure that the shockwave of a possible implosion of the UK does not also damage the European project. The British exit has that potential, now that Theresa may has commenced the process in a manner so foolish, so unprepared and lacking in any plan. Es ist keine Uhr, die ab heute tickt, sondern eine Zeitbombe, die locker die Sprengkraft hat, das Vereinigte Königreich zu zerstören. Ohne den Hauch einer Ahnung, wie man in knapp zwei Jahren den Ausstieg erfolgreich verhandeln will, blieb Theresa May heute in ihrem Brief an Brüssel, trotz eines deutlich sanfteren Tons erneut dabei, im Zweifel ohne einen Deal aus der EU auszuscheiden. Einen solchen ‘Crash-Exit’ kann man locker verkraften, hatte kürzlich auch ihr Brexit-Minister erklärt, musste dann aber zugeben, keinerlei Zahlen zu haben. Aber Fakten stören auch nur. Gestern erst verließen die Konservativen Brexiteers einen Parlamentsausschuss, nachdem die Risiken eines harten Brexit vorgelegt wurden. Der Bericht sei zu negativ, hieß es und… weg waren sie. So genau will man das alles nicht wissen im Brexit La la land. Die Zukunft in der ‘Splendid Isolation’ wird glorreich, die Schlacht um den Brexit muss gewonnen werden. Jede mahnende Stimme wird so im Keim erstickt. Den Schotten wurde vorläufig untersagt, die Reißleine zu ziehen, eine Front, die immer explosiver werden wird, sollte es auf einen harten Brexit zulaufen. Theresa May hatte neun Monate Zeit, die Hardliner auf die Realität vorzubereiten. Bislang deutet nichts darauf hin, dass ihr das gelungen ist. Die EU muss nun im eigenen Interesse dafür sorgen, dass die Schockwelle einer möglichen Implosion der Insel nicht auch noch das europäische Projekt sprengt. Das Potential dazu hat der britische Austritt, so leichtsinnig, so unvorbereitet und planlos Theresa May ihn heute begonnen hat. Annette Dittert, Korrespondentin für ARD, London. It’s one of the first things we learn, no matter which language we are speaking. In German, Italian, Spanish and French it’s part of the daily greeting but not in English, apart from ‘G’day!’ in Australia. ‘Good day’ exists in British but it’s now old-fashioned. At the beginning of each day we just say ‘good morning’ or maybe ‘hello’. Did you know that the days of the week are named after the planets? Monday is ‘Moon-day’, Saturday is the day of Saturn and Sunday needs no explanation! You can research Tuesday to Friday yourself! Daybreak is the very beginning of the day, when the sun starts to appear above the horizon. The day is divided into daytime and nighttime. We work in the day and sleep at night – though for some it’s the other way round! The Moon at night. Monday is named after it. Older people like to say ‘in MY day’, with stress on ‘my’. It means ‘in my time’, when I was young’. Uncle Albert in the TV comedy Only Fools and Horses liked to say this. People refer to their ‘salad days’, the time when they were young and inexperienced. That comes from Shakespeare. ‘Days’ often means a stage or chapter either at the beginning: ‘It’s early days’ – or at the end: ‘It has seen better days’, a polite way to describe something that’s old and run down. ‘It has had its day’ means its ‘glory days’ are in the past. ‘Days of Heaven’ is a favourite film of mine. ‘On this day’ is a feature found in the media about events that took place on a particular date in the past. It should really be ‘On this date’ but that doesn’t sound so good! ‘Those were the days’ is an expression of nostalgia, like ‘the good old days’ and is the name of a song by Mary Hopkin. Days can also be bad. People talk about the dark days of the war. Many people like to daydream. Some say it’s a waste of time though it can be very productive. I love to daydream! Day is also a surname. Doris Day is perhaps the most famous person named ‘Day’. Day is also important in travel. You can by a Day Ticket to travel on buses trains or trams. If you’re travelling by ferry, you can take a ‘day sailing’. The Beatles sang a song about a ‘Daytripper’ and there’s also ‘Yesterday’, perhaps their most famous song. Two days ago it was ‘the day before yesterday’ and two days from now it will be ‘the day after tomorrow’. ‘Day’ is something to look forward to in the future, when people finally have justice: ‘Our day will come’ or ‘We will have our day in court’. Sometimes the original meaning seems to be transformed. Superman always ‘saves the day’ – he is victorious, he beats the baddies and protects everyone. Mayday is the international emergency call and refers to the first day of the month of May, a day of celebration. Birthdays and feast days are important in all countries. St Patrick’s Day is on 17th March and St George’s Day is on 23rd April. Please note we say ‘on the seventeenth of March’ and ‘on the twenty-third of April.’ Remember that’s short for ‘on the 23rd DAY of April. ‘ is a bright, sunny word. You might think of the song ‘Beautiful Day’ by U2, though ‘Blue Monday’ by New Order doesn’t sound quite so cheerful. The Domesday Book was a survey of England and Wales made in 1082 by William the Conqueror. Doomsday is the day of the last judgement described in some religions, as well as being the Marvel superhero, Doomsday. If you want to say healthy, remember that ‘an apple a day keeps the doctor away’. ‘At the end of the day’ is used in many poems. It is also a phrase that’s often used – or should I say over-used – by many footballers and managers on TV discussion programmes! Well, as far as this article is concerned, I think we’ll ‘call it a day’ – we’ll finish! I will soon be writing an article on the amazing German word ‘der Tag’. Many people in the UK wear poppies as a symbol of remembrance for the victims of war, especially the fallen soldiers of both world wars. In the weeks before the 11th November, poppies (small paper flowers) are sold in shops, shopping centres, stations and other public places. People take a poppy and give a donation. The money goes to charities like the Royal British Legion, who support war veterans. People wear poppies on their clothes. Larger poppies can also be seen on buildings and cars. The poem ‘In Flanders Fields’ was written by the Canadian Lieutenant John McCrae. In the poem, the poppy is a reminder of the blood that was shed by the soldiers. On Remembrance Sunday (the second Sunday in November) poppy wreaths and wooden crosses are laid at cenotaphs all over the country. At 11 o’clock, two minutes silence is held. The eleventh day of the eleventh month is Armistice Day, the day of the cessation of hostilities. On this day at 11 o’clock, people also observe two minutes silence. In 2014 thousands of ceramic poppies were placed at the Tower of London. The artwork was taken to other places including St George’s Hall in Liverpool. The poppy is recognised everywhere and is worn by many people, including famous personalities. There are controversies, however. Pacifists don’t want to wear the red poppy. For them, the red poppy is a symbol of militarisation. They prefer a white poppy. Some organisations – for instance FIFA – have banned the wearing of poppies as they see it as a political statement. Footballers and fans have protested against this. Whether red or white, there’s no doubt that the poppy will continue to exist as a symbol of remembrance of war and conflict. Click to download a printable Version of this article in English and German. To people from outside the United Kingdom, the British education system is a mystery. There seem to be so many different types of school, college and university, public schools are actually private schools, the exams don’t seem to make any sense, the marking system is confusing and is about to be changed again. Most UK residents have grown up in the UK and know its education system well. It’s ‘assumed knowledge’. If you look for information you will only find lots and lots of web pages with long and detailed information that’s intended for UK residents. No one explains the UK system of education from an outsider’s point of view. I have tried to reduce the huge complexity of the UK education system to 34 points, which are presented as numbered bullet points. I have chosen what I consider to be the most important pieces of information. My aim is to help people from outside the UK to gain a basic understanding the the British education system. They can also learn English words and phrases to do with schools and universities. There is a printable sheet with questions that can be used with students. The download link is at the bottom of this page. 1)	Children from around 1 year old to 5 years old go to nursery school. 2)	Children from age 5 to age 11 go to primary school. 3)	Young people from age 11 to 16 or 18 go to secondary school. 4)	The last two years of secondary education are called the Sixth Form. Sixth Form students are aged usually aged 16 to 18. 5)	At age 16 students can either: A) Enter the Sixth Form if their school has one; B) Leave and go to a Sixth Form college or a college of Further Education. 6)	There are three terms: September to December, January to March/April and April to July. There are also half term holidays. 7)	A comprehensive school accepts pupils of all abilities. There is no entrance test. Comprehensive schooling was introduced in 1965 by the Labour Government. 8)	Most secondary schools are free and funded by the state through taxation. In the UK they are referred to as state schools (not public schools). 9)	Following legislation introduced by the Conservative government, many schools have changed their status from comprehensive school to academy. An academy is state-funded but not under the control of the local authority. 10)	People don’t have to pay to go to a state school. Primary and secondary education in the United Kingdom is free. 11)	Some primary and secondary schools are privately owned and run. Parents pay fees to send their children to a private school. 12)	The so-called public schools in England are group of elite private schools with very high fees (over £30,000 per year). Eton, Harrow, Rugby and Charterhouse are famous public schools. 14)	To attend a grammar school, pupils must pass the 11+ examination, or the school’s own entrance exam. 15)	Children at nearly all primary and secondary schools have to wear a uniform. 16)	Students take their GCSEs mostly at age 16 after five years at secondary school. Pupils generally take 7 or 8 GCSEs, including English and Maths. 17)	Students take A levels at the age of 18. Unlike the Abitur or the Baccalaureate, students doing A levels specialise in just three subjects. 19)	A level Grades are given as letters. A is the top grade. A* (A star) is the highest grade. The bottom grade is E. F is ‘unclassified’ (or fail). 20)	GCSE grades have been changed by the Conservative Government from A to E to a new system from 9 to 1. Please note: 1 is the bottom grade and 9 is the top grade. 21)	Up to 2016, students were able to take AS levels which counted as ‘half’ an A Level and could be taken after one year. This system has now been abolished. 22)	A levels (Advanced level courses and exams) are intended to prepare students for study at university. You need A levels to study at university. 23)	BTEC exams are an alternative to A levels. You can take BTECs in vocational subjects such as Computing and Engineering. 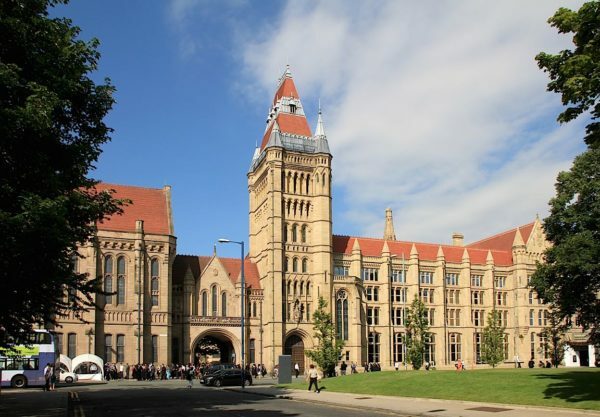 24)	Nowadays, university education in the UK is not free. Most students take out student loans. Some high achieving students may receive scholarships. 25)	Most undergraduate courses at UK universities are three years long. 26)	Modern language students have to spend one year in the country whose language they are studying, generally between the second and the third year. 29)	University degrees are graded in classes: First (1), Upper Second (2:2), Lower Second (2.2) and Third (3). 30)	People say: “I got a two one in English from Manchester University” or “I did History at Liverpool University but I only got a two two” or “She got a first in Archaeology from Oxford”. 31)	An undergraduate is someone who is studying at university but hasn’t yet finished their degree. A graduate is someone who has completed their degree. 32)	After you have graduated, you can study for an MA or an MSc, also called a Masters degree. This usually takes one year. 33)	If you are a graduate and would like to teach in a school, you must study for the one-year PGCE – Post Graduate Certificate in Education. Thanks for reading my quick explanation of the British education system. It’s impossible for me to describe everything and I hope I have presented the most important information. Was it clear? Have I made any mistakes? Hauptbahnhof written in large white letters above the main entrance. Inside the station we have an advert for Kölnisch Wasser – Eau de Cologne. 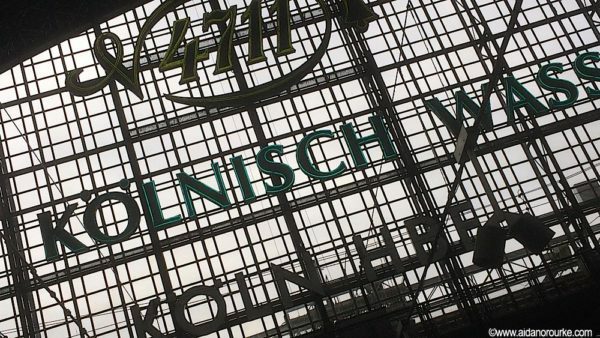 The brand is siebenundvierzig elf and Köln Hbf means Köln Hauptbahnhof – main station. At Nuremberg airport a sign for Metropolregion Nürnberg. The M and the N are written small but they should be capital. It’s just a stylistic feature that’s sometimes used and as a language teacher I disapprove of it! Capital letters should be used correctly. 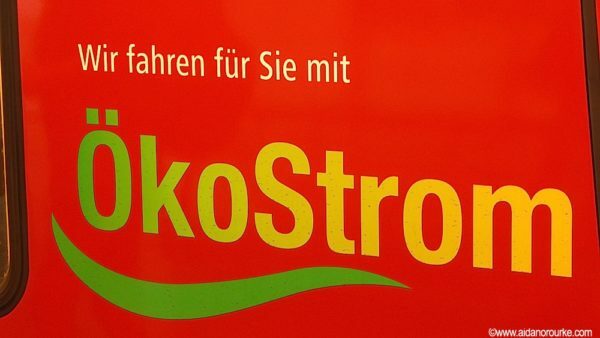 The slogan: Kommen. Staunen. Bleiben. – Come. Be astonished or be amazed. Stay. In the U-Bahn station at Nuremberg airport: Kurzzug – it’s written on the electrified rail Kurzzug – short train. This is where the shorter train stops Gleisbereich Betreten verboten – the area of the tracks entry forbidden Für Hilfe Notruf benutzen – for help ring the emergency call or emergency phone. Unbefugten ist der Zutritt verboten – to people without permission the entry is forbidden. Unbefugten the dative plural. Notbremse – emergency brake – Missbrauch strafbar (new spelling) – misuse punishable. In Nürnberg main station an advert for the Green Party during the 2017 election. Umwelt ist nicht alles. Aber ohne Umwelt ist alles nichts. Environment is not everything but without environment everything is nothing. Bitte Motoren abstellen – please turn off engines. At Dresden Hauptbahnhof as at many other stations in Germany there are lots of shops. In the sign – Viele tolle Geschäfte – many great shops – direkt auf Ihrem Weg – directly on your way. One of them is Lidl. 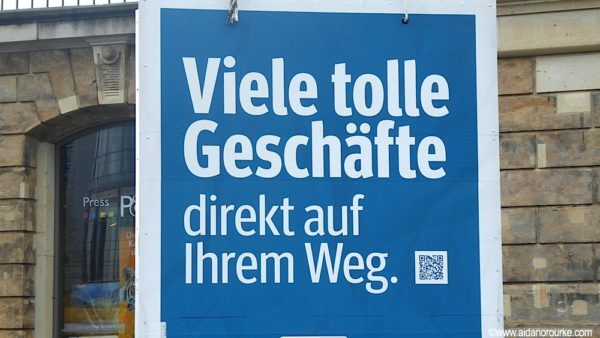 The slogan in Germany is: Lidl lohnt sich – Lidl is worth it. the Art Collections of the city of Chemnitz. 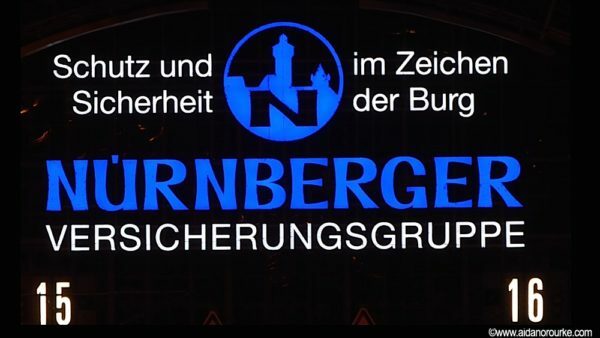 Another advert in Leipzig station for Nürnberger Versicherungsgruppe – the Nuremberg Insurance Group – Schutz und Sicherheit im Zeichen der Burg – Protection and security under the sign of the castle. The numbers fünfzehn and sechzehn are Gleis. Gleis fünfzehn – Platform 15 – Gleis sechzehn – Platform 16. Also inside Leipzig Hauptbahnhof a sign with the opening times of the Promenaden shopping centre inside the station: Montag bis Samstag zehn bis einundzwanzig Uhr geöffnet. Another cultural advert it’s for the Gewandhausorchester, the famous Gewandhausorchester based in Leipzig in superb handwritten script. where the lift is – der Aufzug. On German trains they tell you which side to get off –Bitte in Fahrtrichtung links aussteigen – please get off in the direction of travel on the left. 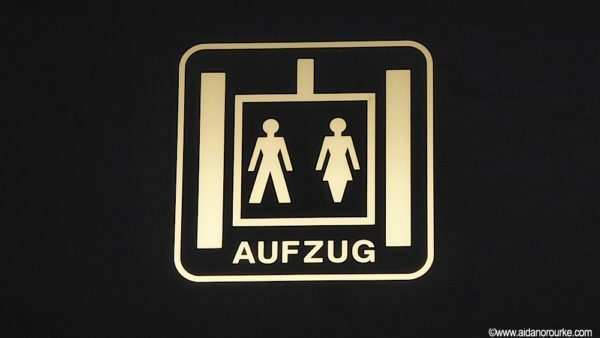 Der Aufzug – that’s the lift. So if you’re going on a holiday Gute Reise! And that’s all for this edition of German in a Few Minutes. Please subscribe and click the ‘Like’ button. Vielen Dank! -chen is not a word in itself. It’s a sub element that is attached to the end of a word and the dictionary says its use is diminutive. That’s to say, it’s used to give the word a sense of small and perhaps cuteness. -chen is attached to many words in German in some interesting ways. Probably the most common -chen is das Mädchen. The main part of Mäd is never used on its own. -chen is added to give it that diminutive or ‘cute’ – ‘niedlich’. Some would say it’s sexist but we must remember, language is an inheritance from the past. Every word in ever language is in its own way archaic or will be in the future. So das Mädchen is and will remain the German word for ‘girl’ but then there’s another anomaly. All words ending in -chen are neuter. But remember, genders are mostly not a biological description but a grammatical classification. The table, der Tisch, is masculine, die Lampe feminine and das Handy is neuter. Although das Mädchen is grammatically neuter, she is biologically feminine. So although we may talk about ‘das Mädchen‘ when we refer to her using a pronoun, the pronoun is ‘sie‘. There are, I understand, some dialects of German where they refer to das Mädchen using ‘es’ but this is very unusual! So what other words end in -chen? Das Märchen – fairy tale; das bisschen, more commonly ein bisschen – a little bit; das Kaninchen – rabbit a ‘little Kanin’ though Kanin is rarely used – in Physics das Teilchen is a microscopic particle; das Weibchen – in Biology feminine animal – das Männchen – similarly masculine animal but it can also refer to a little animated man. And we can see another interesting feature – the vowel becomes Umlauted when you add the -chen. das Brot becomes das Brötchen and so on. The use of -chen becomes even more interesting when people put it onto the end of all kinds of words. Eine Weile becomes ein Weilchen – a little while; eine Stunde becomes ein Stündchen . I love it when they add it to greetings; Hallo becomes Hallöchen! ‘little hello’ – you just can’t transate it! How about Tagchen! and tschüsschen – a (cute little) bye bye. I found the ultimate strange and wonderful use of -chen in an advertising campaign for easyJet around 2004. To emphasise how small and ‘niedlich’ cute their prices are, they added the -chen to destinations. Amsterdam became Amsterdamchen – Barcelona was Barcelonachen and a usage that really made Liverpool small and ‘niedlich’ in an attractive way: Liverpoolchen. There is no end to the inventiveness of language, especially the German language, which is why it’s so fascinating to study it. Hopefully you’ll remember many of the useful words on this page – don’t bother trying to remember the easyJet destinations! Unlike many place names, Cologne sounds cool and positively fragrant. It originates from Colonia, an important Roman town and the fragrance comes from the time of Napoleon. The German name Köln sounds equally cool and in the local Kölsch dialect it’s Kölle. It’s situated on the wide and gently curving river Rhine – der Rhein – and if you’re arriving by train from the north or east, you will cross the river on the magnificent railway bridge – die Hohenzollernbrücke. Before I write any more, I have to say that as a visitor, I prefer to explore rather than be told where to go. I also don’t enjoy being overloaded with historical information. My motto is: experience first, facts later. Having said that, it’s not bad to have a few clues of places to see and a few tips for visitors – Besuchertipps – so read on. Let’s go back to that railway bridge, and the train moving across it, and between the criss-cross girders, there’s the magnificent wide river and then Cologne Cathedral – der Kölner Dom. The train stops at the Hauptbahnhof – the main station. 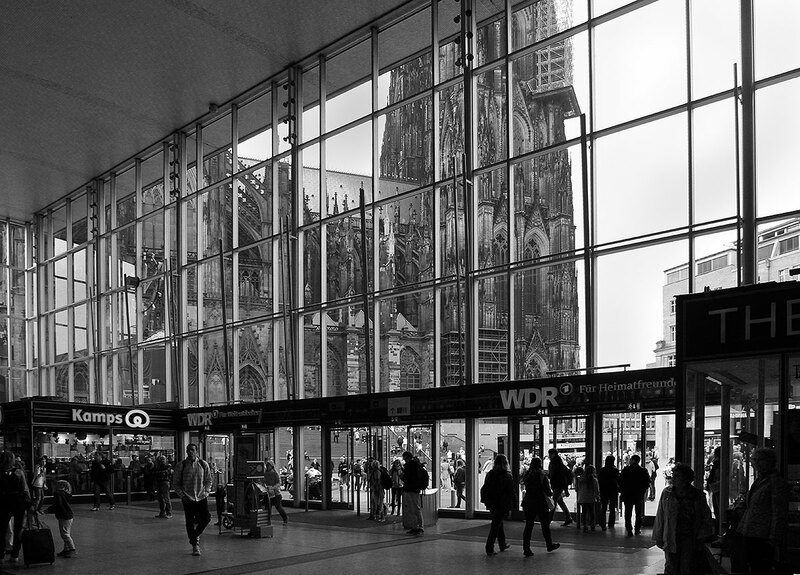 Be sure to go to the front of the station, not the rear as I did – and as you walk into the entrance hall, there is the Kölner Dom in all its glory, filling the massive plate glass windows. Out of the station, into the pedestrianised square, then up the steps and you’re standing in front of one of the most incredible feats of medieval engineering in the world. Cologne Cathedral is gigantic, overwhelming. Try to imagine how it must have appeared hundreds of years ago. Like many cathedrals it took centuries to build. Inside, as you look towards the altar, your eyes are drawn upwards. It seems twice the height you’d expect. Most of north Germany is Lutheran but Cologne – roughly in the middle to the west, not far from Belgium – is Roman Catholic. That affects the character of the churches and the city itself. It’s difficult to describe, so I’m not going to try! For a bird’s eye view of Cologne, it’s possible to climb the tower, but it’s only open until five. If you look at photos of Cologne, you’ll notice the cathedral is often paired up with the railway bridge. That’s one of the unique aspects of the city. I can’t think of any other combination like this. 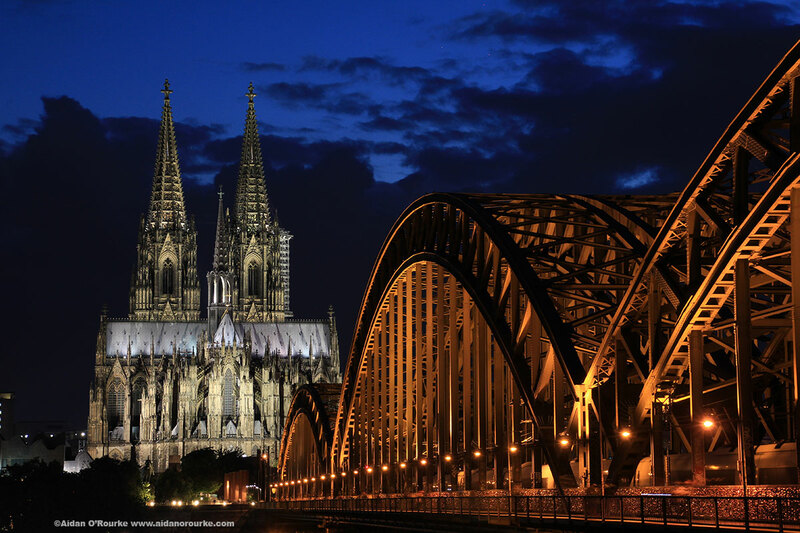 Cologne is known as the ‘Domstadt‘ – the cathedral city but it could equally be called ‘die Eisenbahnstadt‘ – the railway city. 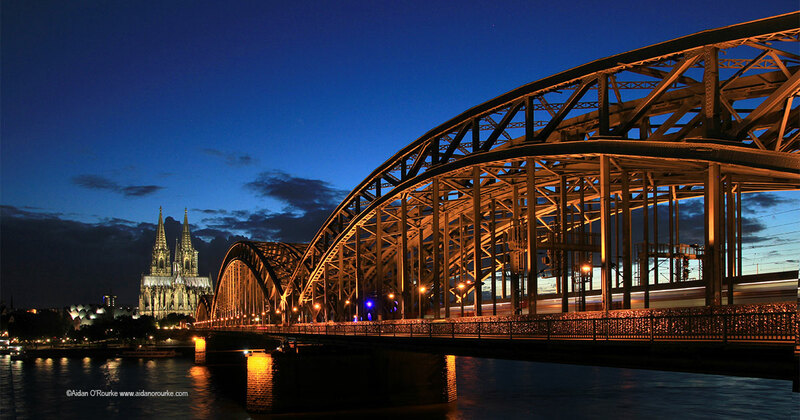 The most famous view is the one of the Cathedral and the railway bridge at dusk from the other side of the river. We walk onto the bridge along the pedestrian walkway past thousands of padlocks attached to the railing. Following an Italian tradition, the padlocks are left by couples as a permanent symbol of their love. The trains pass very close on the other side of the fence. It’s practically low enough to jump over. In many other countries that would be considered a security risk. Here in Germany it’s not a problem, it seems. Now on the east side of the river, we look back towards the cathedral and we can see one of the most famous views in Germany. At first sight the cathedral is a lot smaller than I was expecting. That’s because the river is wide. The distance is about 600m or half a mile. You need to zoom right into the view. I have a powerful zoom lens on my Canon DSLR. Placing the camera on the stone wall – I never carry a tripod – I hold the camera firm on the stone and take a number of exposures. I’m very pleased with the view and happy that I’ve finally taken that classic shot of Cologne myself. All the light has drained from the sky now, so it’s time to make our way back for something to east – the station has all kinds of shops and restaurants and they stay open very late. That’s all from Cologne – Köln. This is truly a fantastic city and there’s plenty more to see but we’ll leave that for another day. I originally put together an e-book named Learn German Through Signs which is available to download for free. I decided to try out the format in the form of a video and this is the first one I’ve done. We go on an imaginary bike ride around Berlin, starting from Berlin Schönefeld Airport. I describe the signs, explain the meanings of the words and highlight some important grammatical points. I say the words aloud in German so you can hear the pronunciation. There are eighteen signs featured in the presentation. The aim is for you to learn some useful new vocabulary and phrases as well as understanding signs you will encounter on trips to German-speaking countries. Signs tell us a lot about the culture, atmosphere and design values of the country. German signs have their own look and feel. I’m interested in design and layout and photography is part of what I do. Signs and symbols are the link between language and visuals. We can learn a lot of German by looking at signs. Proudly pro-European, linguist, photographer, writer, videographer occasional musician and dedicated freelance teacher. I’m British/English by birth and residence, first generation Irish by background and I feel partly German through my knowledge of the language and culture.I love to travel but I also love where I live. 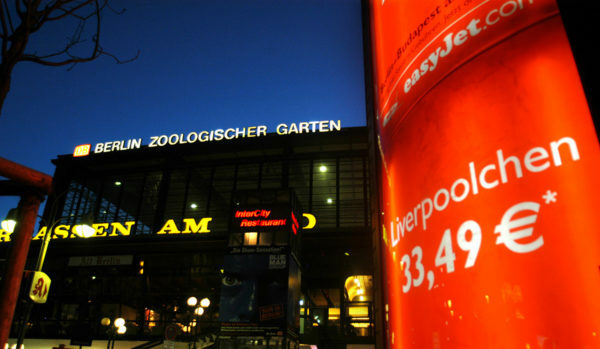 I feel equally at home in Liverpool or Manchester, Dublin or Berlin.